Do you hesitate to make last-minute booth changes at career fairs because you've already printed the floor map? An interactive digital map can be updated seamlessly and cut down on some of the paper students have to manage. 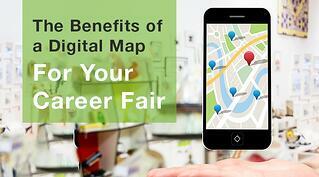 Let's take a quick look at some of the benefits of a digital map for your career fair. A digital map allows you to update changes to your floor map instantly. If a recruiter cancels at the last minute or the electricity isn't connected in a booth, you can live-stream the information to everyone affected. On the map included with Career Fair Plus app, all the changes are visual so students will be able to find the employer tables they need. The interactive map from Career Fair Plus allows students to mark employers as favorites so they can plan their route ahead of time. A quick glance at their Android or iPhone will help them navigate the fair efficiently. So your students will move through faster making controlling the crowd flow a bit easier. Paper maps are better than nothing, but they are hard to read and manage. If you have a large career fair, the table icons are so small you have to resort to initials. Students are already carrying resumes and portfolios. A paper map gets wrinkled and illegible by the end of the day. A digital map is easy to read. Students can easily zoom in to read details about the recruiters. Career Fair Plus allows students perform a quick electronic search for to find employers without having to scan the entire map. Digital maps make it easier for students to navigate through your career fair. You can update information immediately and cut down on the paper waste. Plus students can plan ahead by marking the employers they want to visit and reduce walking time.